Heavy timber construction is a building method that uses large, rustic, heavy sawn timbers or structural glue laminated lumber that is joined together with traditional mortise and tenon joinery or modern metal joinery. Also known as post and beam construction or mill construction, timber framing in floor and roof assemblies dates back to the beginning of civilization. The first completely self-supporting timber frame structure is believed to have been constructed during the 10th century. Developed since that time, the building method was brought to North America in the seventeenth century by European settlers. This traditional building style was used well into the nineteenth century to construct places of shelter, congregation, agriculture, industry and commerce. During that time, heavy timber was produced by hand with axes and saws. With the twentieth century came some challenges for timber framing in North America; while timber framed structures were still being constructed, they were expensive, and came under increasing scrutiny for their vulnerability to earthquakes. 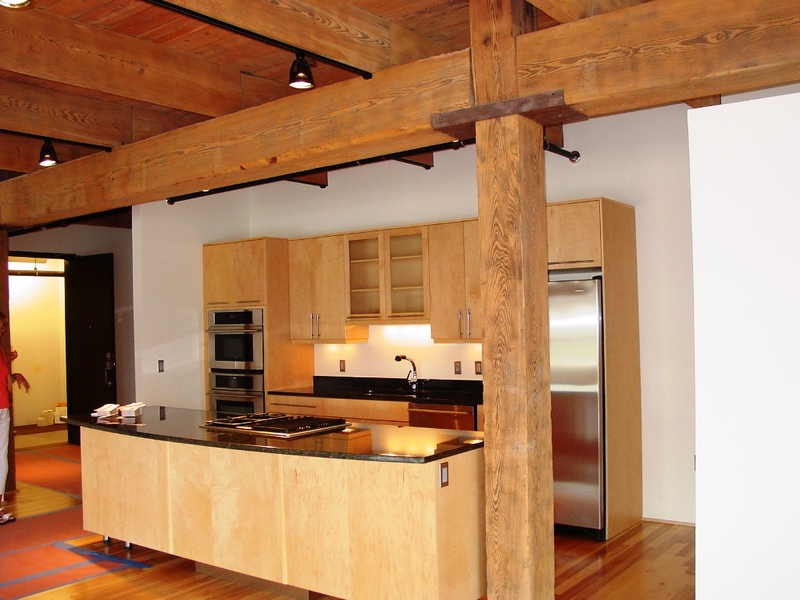 The advancement of technology and design improvements helped to revive North American heavy timber framing in the 1970s. While some heavy timbers are still hand crafted today, power tools and computer numerical control (CNC) machines have assisted in the resurgence of heavy timber construction. The use of CAD/CAM and CNC machines allows for the production of heavy timbers to exact specifications, eliminating repetitive hand labor, increasing production, decreasing labor costs, and making heavy timber more affordable. The machine production of heavy timbers is initiated with a CAD/CAM design that directs a CNC machine to mill, saw, mortise or drill heavy timber, per specification. Using this method, one heavy timber member can be exactly reproduced an infinite number of times. In some cases a heavy timber member can not be CNC machined, whether because the joinery is too complex or the size of the tree is too large or oddly shaped, in which case the heavy timber can be produced by hand or with power tools. Handhewn timber today is more commonly milled, sawn and planed with power tools than with axes and saws, although some hand tool finishing is required. Heavy timber structures have similar member types as light-frame structures, but they use larger wood members -- and fewer of them -- to form the buildings structure. Members that are used in vertical applications, providing support to members above, are called posts or columns. Members that are used in horizontal applications, which carry the live and dead loads from above to the posts below, include beams, girders and joists. 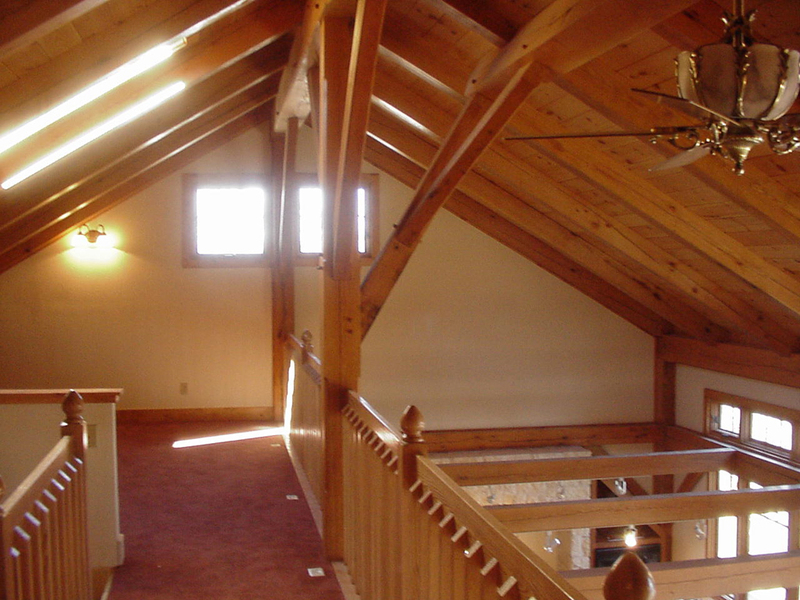 Wood floor planks are commonly installed over floor beams, similar to wood roof planks which are installed over purlins. 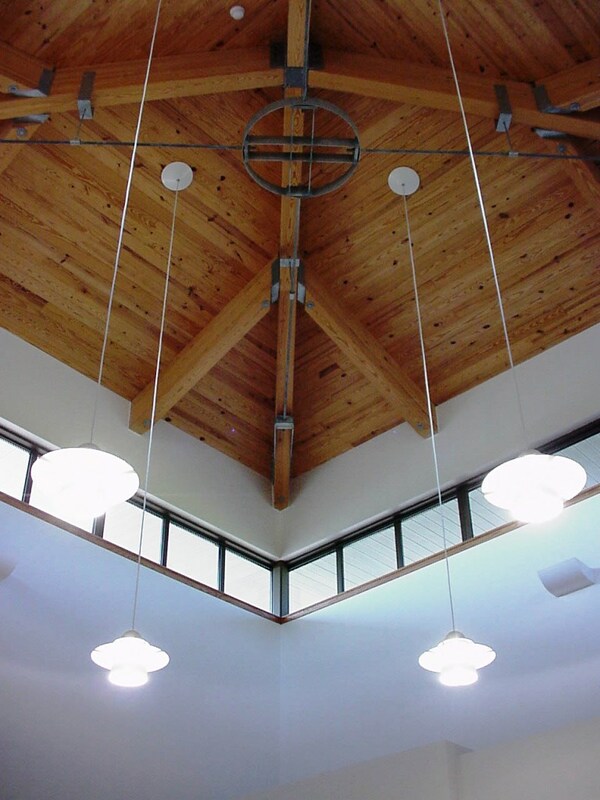 Purlins are connected to the top of the roof structure, which is usually constructed with a number of heavy timber trusses or rafters. 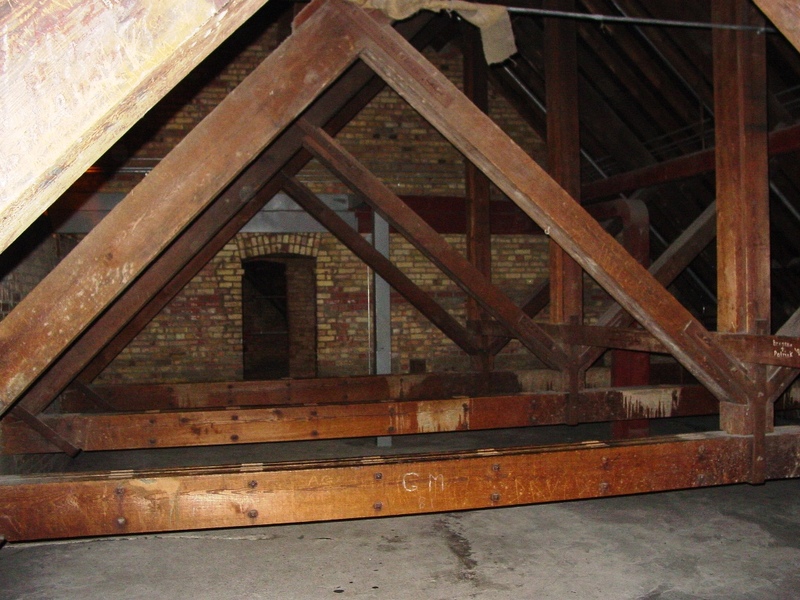 The purlins carry the live and dead loads from the roof above to the trusses or rafters below, where the loads are then transmitted to the outer bearing walls. 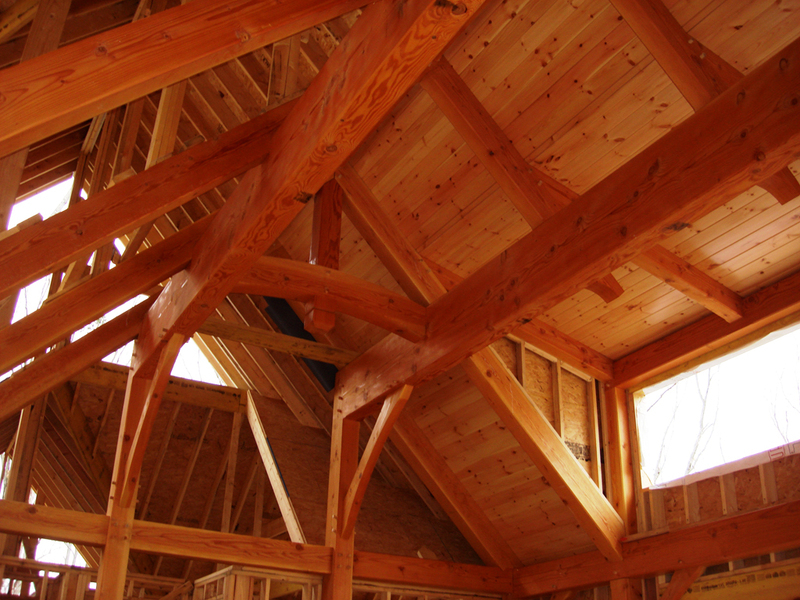 Unlike light-frame structures, heavy timber structures are not fastened together with nails or screws. Two types of connections are used in heavy timber construction: mortise and tenon joinery or modern metal or wood connections. Traditional mortise and tenon joinery involves two pieces of timber that are cut and shaped in such a way as to fit together. One piece is mortised with a slot or hole to accept the other piece, which has a tenon or projection. Depending on the load requirements, tenons can be 1 1/2 inches to 3 inches thick, and 4 inches to 10 inches long, After the two pieces are joined they are pinned together with hardwood pegs. Several types of mortise and tenon joinery are used, depending on the timber member application. They include: double through, brace, dovetail, shouldered, or tongue and fork mortise and tenon. Double through mortise and tenon is commonly used in cases with significant tension; it has two slots on one member and two tenons on the other member. Brace mortise and tenon is used where a diagonal brace is joined with a post or girder. Dovetail mortise and tenon is used where a joist or purlin is joined with a truss, beam or girder. Shouldered mortise and tenon is used to join a girder and a post, and tongue and fork mortise and tenon joins the ends of rafters at the ridge. Modern metal joinery includes heavy steel gusset plates with bolts, which are typically specified for structural or aesthetic concerns. Additional modern connections include post anchors, post and beam connections, hangers and anchors. Post anchors include metal shoes bolted with bearing plates, metal straps that are bolted and/or embedded in concrete, and metal angles with bolts. Post and beam connections include metal caps with lag screws, metal brackets with bolts and shear plates, metal anchor straps with bolts, wood bearing blocks with split ring connectors, and precast reinforced concrete caps with lag screws. Heavy timber construction requires the use of a crane to lift timber members or pre-assembled portions of the frame into place. 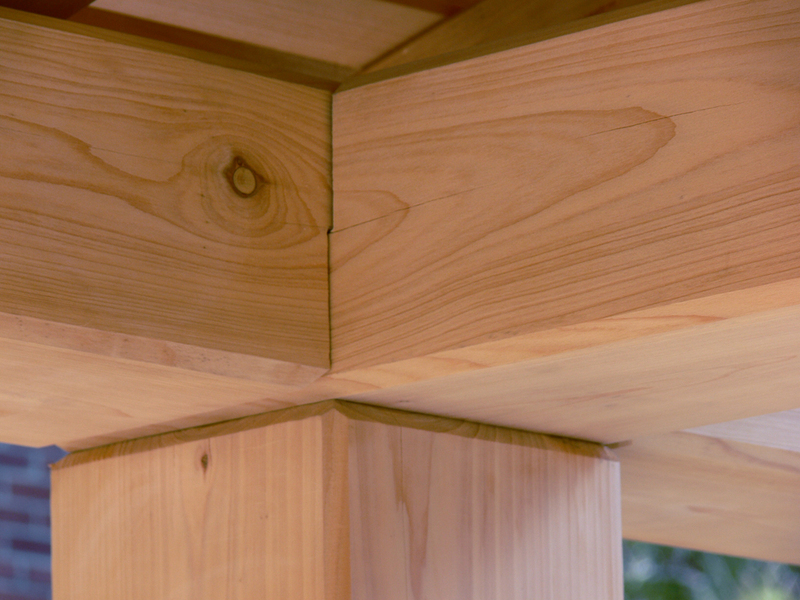 The framer will make the joinery connections, and when all of the pieces are in place, the connections can be tightened and the frame is completed. 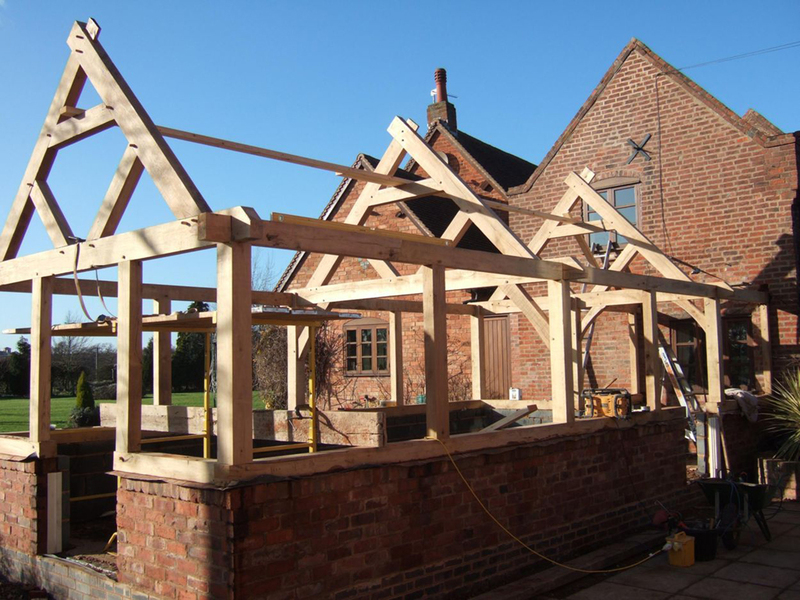 The construction of an average size heavy timber structure frame can typically be erected in two to three days. The exposed structural timber frame requires immediate construction of exterior walls, along with the roof, to dry in the building. When light wood framing material is used in the exterior wall assembly, heavy timber construction is classified as Type V construction type. This building code classification identifies construction types in relation to combustibility. Type V, Wood Frame is the highest combustible construction type and includes single family residential dwellings. When masonry or concrete material is used in the exterior wall assembly, heavy timber construction is classified as Type IV - Heavy Timber. Type IV classification is also a combustible building type, but it requires the use of minimum sized timbers which, due to their size, inherently provide protection from structural failure as the result of a fire. A testament to this old building method's strength and durability can be found in Europe, where timber framed buildings constructed over 500 years ago are still standing today. 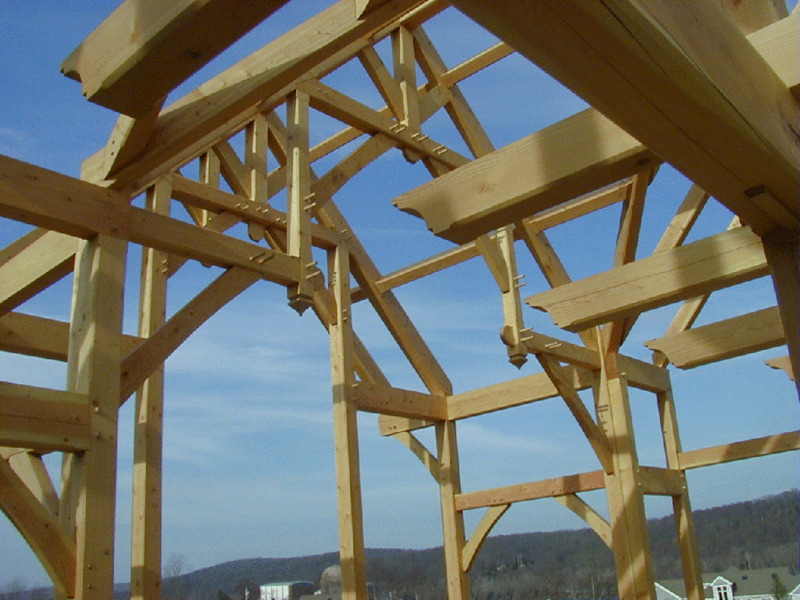 Timber frame construction is commonly used today in religious, educational, commercial and residential buildings.